Now that winter is pretty much over (well not here in YYC! ), we will see the end of Fairmont's Everyone's an Original Winter promotion on April 30th which will be replacedd as it is every year, with the Everyone's an Original Summer promotion. The promotion has not changed for years, its still Double Airline miles but the rest of the offer usually changes on an almost weekly basis. Sometimes they throw in free nights or Food & Beverage credits depending on the week and the location. To launch the latest version of this offer, Fairmont is offering up to 20% off or a free night depending on the location you book at. Fairmont President's Club members will enjoy an additional 5% off the Everyone's an Original summer rate. 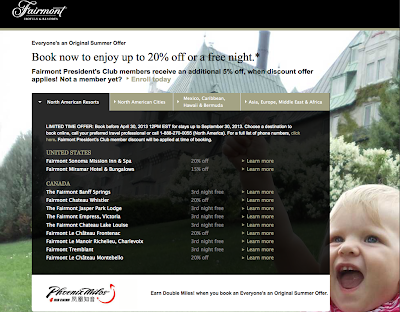 The 20% off/Free Night is good for bookings made by April 30th for stays until Sept. 30. In addition to these discounts you can earn double miles with participating airlines which for the summer version has a lot more of Fairmont's airline partners when compared to this past winter's offer. The double miles is not affected by April 30 booking deadline and is available straight through to Sept. 30. Here is the offer as it will appear on FFB's Fairmont page tomorrow and also provides access to the complete offering as listed above. This is the official blog for RewardsCanada.ca, Canada's Frequent Flyer and Travel Rewards Resource since 2001. Disclosure: We receive compensation from some credit card companies featured on this site. Although we are compensated for every credit card that is approved via our website affiliate links, our research and content are based on an objective analysis. Which Credit Card Earns the Most Aeroplan Miles? © 2001 - 2019 Rewards Canada. Part of the FFB Group. All rights reserved. Simple theme. Powered by Blogger.